At your initial visit, our experienced team can discuss which type of dentures are most appropriate for your dental situation and budget. Both types are removed at night when you sleep. Partial dentures are attached to your existing teeth, anchoring them with plastic or metal. If necessary, we can extract teeth to accommodate your new dentures for a perfect fit. 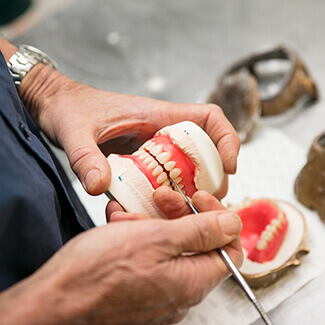 We’ll start with taking moulds that are used to custom-create your dentures at our on-site laboratory. If extractions are required, we’ll give you a temporary denture to fill the gap. Your dentures are then prepared and fitted at your next appointment. Contact us today to learn more! We’re in-network providers with many health fund plans and process your claim immediately with HICAPS.